How does owning a pet change us? How do animals impact on the health of their owners? How do we rethink the way we address human-animal relationships in natural disaster situations? These are the questions Pauleen Bennett and her students ponder. When world anthrozoology expert Pauleen Bennett left high school, she had a passion for animals, an incredible amount of energy and a simple dream to meet and marry Prince Charming. Life didn’t pan out exactly how she had planned. She turned her previous hobby of horse-riding into a job, but after several years of 5AM starts with no sign of Prince Charming this career path rapidly lost its shine. A careers advisor suggested she enrol in a behavioural science degree through La Trobe University. A decade later, Bennett had two bachelor degrees, a master’s, a PhD and a position as an academic at Monash University. Most of her research activities were centered around behavioural neuroscience and clinical neuropsychology. Bennett was working so hard she needed a break. Bennett and her partner Ron began breeding Jack Russell Terriers before they became involved in breeding Australian Shepherds. That is where her foray into the study of animal welfare really began. She docked the tails of the first litter, as per the breed standard. The decision made her unpopular – she received hate mail and threats to poison her dogs. It was a tough time. That year, for Christmas, one of Bennett’s students, Eloise Perini gave her a folder filled with research papers on tail docking and related issues. That paper was published in the Australian Veterinary Journal in 2003, at a time when Governments were assessing the issues around tail docking. “I was quoted as someone who had come up with evidence against tail docking, which I wasn’t, but I had to wear that,” Bennett said. That cost her some friends – but won many more. Bennett found herself knee-deep in the field of animal welfare – and fascinated with the relationships people share with their pets. She embarked on a career in anthrozoology. Anthrozoology, taught in most Australian veterinary schools, is derived from the Greek ‘anthropos’ meaning human, and ‘zoon’ meaning animal. It is the study of human-animal interactions. According to Bennett, the human-animal relationship didn’t evolve in a vacuum. 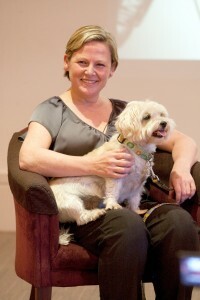 “When we see animals that are contented we feel pretty safe – we look to animals for cues to assess the world,” she said. “One advantage is that they don’t get caught up in all the hype we get caught up in. They live their lives every day as if it’s great – like you or I thinking ‘Today is Thursday…how great is that?’”. In the field of positive psychology, there are five components to a good life: pleasure, engagement, meaning, relationships and achievement. Bennett said that pets tick at least four of the five boxes – five for those who use their animals in achieving (for example those who show dogs or compete in agility). Bennett is also fascinated by our somewhat irrational approach to animals. But Bennett is no idle navel-gazer. When she poses a question like this, she answers it with a scientific study. Bennett is recognised as one of the world’s foremost authorities on anthrozoology, reflected in her roles as the current president of the International Society for Anthrozoology and the Chair of the Australian Anthrozoology Research Foundation. She is Director of Regional Operations for the School of Psychological Science at La Trobe University and continues to supervise PhD candidates at La Trobe, as well as at several other Australian universities. Bennett doesn’t have a lot of time to run her own projects these days, but she supervises a large group of students. In a similar vein, former Honours student Josh Trigg is looking at the role of pets in natural disasters. “Some people are dying in these situations because they won’t leave their pets when told to evacuate. But there may be some way we can encourage people to evacuate to save their animals – and we may save more human lives in the process,” Bennett said. Tammie King is evaluating tests of amicability, so this can be measured and bred for, while Kate Mornement is studying the way dogs are assessed in shelters. Mia Cobb is looking at ways to ease the transition from foster family to Guide Dog training for prospective guide dogs, who may otherwise find leaving a foster family after twelve months a stressful experience. Dom Trescowthick is comparing attitudes to cats in Australia with New Zealand, where registration and microchipping of cats is not compulsory. Bennett is also co-supervising two Queensland University students who are investigating problems around re-homing cats, a major challenge for Australian shelters. In her spare time, Bennett breeds Lagottos. “That is because I got together with my students and brainstormed the best dog for today’s world.” PhD student Tammie King also did a big survey asking the Australian public what they want in a dog. Not all cat and dog breeds are suitable. Most traditional dog breeds, for example, are working breeds, with qualities such as barking at intruders, warding off strange dogs and people and killing rodents sought after traits. These days, owners want the opposite – a friendly, not-too-energetic, easily managed and trained dog who fits in as part of the family. Bennett is hoping to raise more funds through the Australian Anthrozoology Research Foundation to support further research into human-animal relationships. While historically perceived as a somewhat “soft science”, anthrozoology’s time has come. And acknowledging that human-animal bond is important to the bottom line. Bennett may have started out without a roadmap, but she knows exactly what she hopes to achieve. Bennett PC & Pereni E (2003) Tail docking in dogs: a review of the issues. Australian Veterinary Journal 81(4):208-218. Bennett PC & Pereni E (2003) Tail docking in dogs: can attitude change be achieved. Australian Veterinary Journal 81(5):277-282. King T, Marston LC & Bennett PC (2009). Describing the ideal Australian companion dog. Applied Animal Behaviour Science, 120 (1-2), 84-93.